VALERIE - a French name meaning strength and health. This rustic tone necklace says it all. 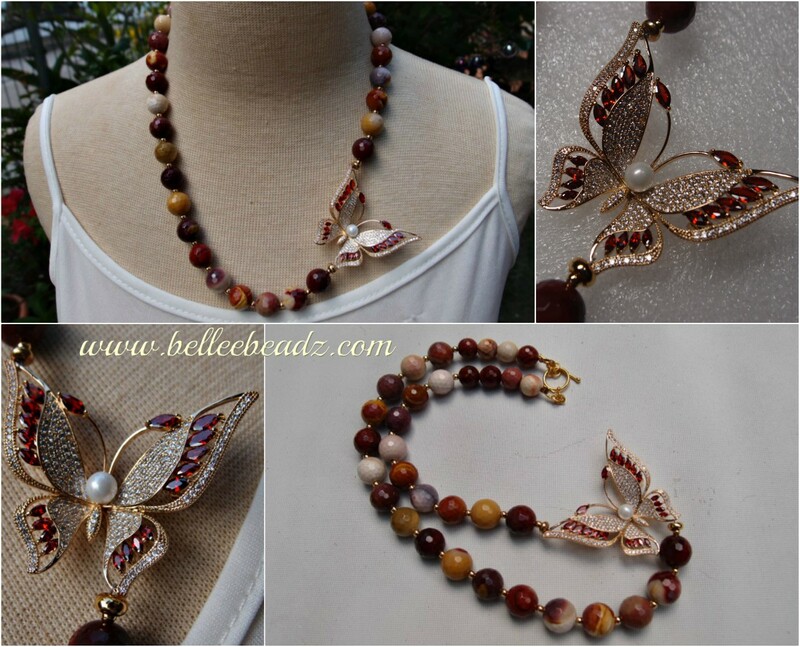 I spent a good part of this afternoon deciding on first the beads to accompany this outstanding crystal pave butterfly - love the wine tone of the marquis cut crystals and the faceted mookaite beads. Mookaite is a mineral featuring earthy tones and supposedly exude a positive energy to slow down ageing. So they say. The colours in this creation are warm and comforting....deep red, maroon, purplish grey, camel, sand....combined with the tiny pave crystals and white shell pearl of the butterfly, this is a radiant piece. Mookaite measure 12mm, whilst the butterfly connector measures approx 5.5cm diagonally and 5cm at its widest.